I feel like this post is one I have been meaning to write for quite awhile. When starting a blog or youtube, you are always searching the net trying to find out what you need to make your content the best and of course great quality. Today I will be talking about External Microphones, Being a YouTuber has changed the way I film, Edit and my layout of when I film. I started with just my Dad's Compact Camera then moved onto my sister's Canon Superzoon Camera before I invested in a Canon 1000D to only realise it didn't film videos! ( I know crazy! ) Two Years later my Canon 600D came along and I've invested in proper lighting and now even an External Microphone to cancel out the background sounds that are surrounding the room. There are loads of Things Worth Investing In and for me an Mic made a huge difference on the quality of my videos in Sound and background sounds. 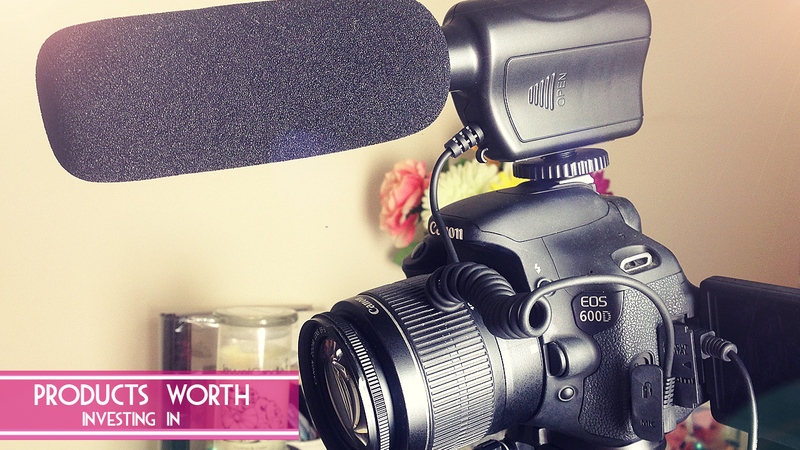 Is there anything you think is worth investing in for your blog or your YouTube Channel? Leave me a comment below and share with us all! What Products are worth investing in? share and let me know in the comments below.